대방광불화엄경소는 대승경전의 하나인 화엄경(주본(周本))을 저본으로 당나라 징관(澄觀)이 주소하고 여기에 송나라 정원(淨源)이 주해한 교장류(敎藏類)의 일종이다. 일반적으로 ‘대방광불화엄경(大方廣佛華嚴經)’은 줄여서 ‘화엄경(華嚴經)’이라고 통칭되기도 하며, 부처와 중생이 둘이 아니라 하나라는 것을 중심사상으로 하고 있다. 우리나라에서는 화엄종의 근본경전으로 ‘법화경’과 함께 한국 불교사상을 확립하는데 중요한 영향을 끼친 경전이다. 이러한 화엄경에 화엄학의 대가인 당나라 징관이 주소한 화엄경소(華嚴經疏)를 송나라 정원이 주해한 것이다. 이 판본은 저자인 정원(淨源)이 의천(義天)에게 상인 서전(徐전)을 통해 보낸 목판으로 주본(周本) 화엄경을 주해한 주소본(註疏本) 120권을 찍어낸 것 가운데 권48, 64, 83에 해당하는 것으로 상태가 비교적 양호한 편이다. 표지는 상즙(橡汁)으로 염색한 종이를 사용하였고, 중앙의 제첨(題簽)은 금니로 그리고 그 안에 표지서명(簽題) 또한 금니로 기재하였다. 판식의 특징은 상하단변으로 계선이 보이고 있으며, 한 행은 15자씩 배자되어 있다. 한 장은 5면씩 접혀 있으며, 점련부분에는 판수제(板首題)가 기입되어 있어 작업과 관리의 편리를 위한 의도로 고려되었던 것으로 생각된다. 지질(紙質)은 저지(楮紙)만을 사용하여 만들었으며, 표면의 광택과 묵즙(墨汁)의 번짐을 방지하기 위해 도침(搗砧)한 흔적이 보이는 상품의 고려지이다. 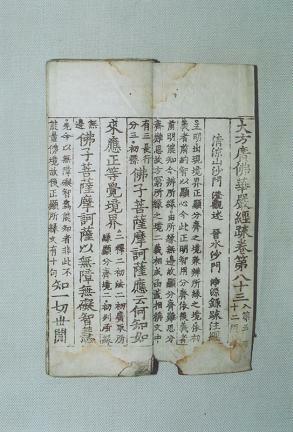 그런데 권83의 말미에 ‘가정(嘉靖) 31年(1552) 임자(壬子)…시봉(侍奉)…’라는 묵서(墨書)가 남아 있는데, 인출기(印出記)로 보기 어렵고 소유를 나타내는 장서기(藏書記)로 생각된다. 자체(字體)는 송판(宋板)에서 유행한 전형적인 구양순체로 보이며, 인쇄면의 필획이 살아 있어 비교적 초기에 인출된 것으로 보인다. 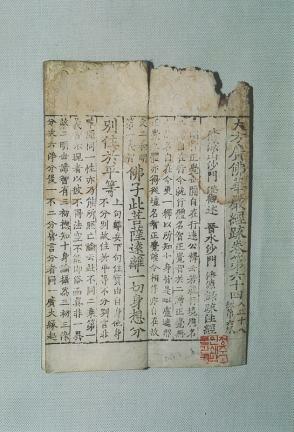 고려시대 주본(周本) 화엄경소 120권 가운데 3책으로서 당시 대각국사 의천(義天)의 불서(佛書) 수집 상황과 더불어 송(宋)과 일본으로 이어지는 문화교류를 알게 하는 소중한 자료가 되는 불경이라 하겠다. 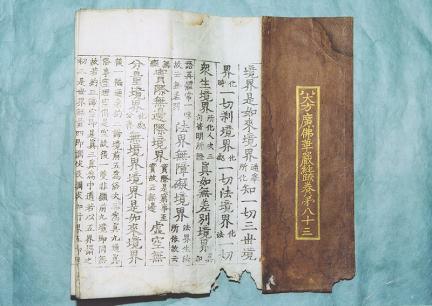 These are interpretational texts written by Jingyuan of the Song Dynasty of China based on Hwaeomgyeong (Avatamsaka Sutra), one of the scriptures of Mahayana Buddhism. 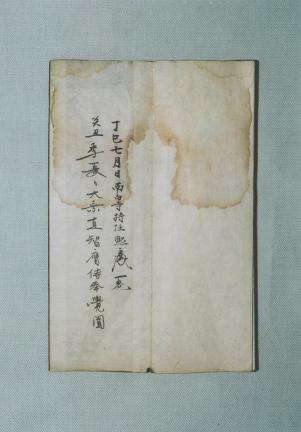 They contain the explanatory notes written by Chengguan of the Tang Dynasty of China. The central concept of Daebanggwangbul hwaeomgyeong (more commonly known as Hwaeomgyeong) is that all living beings and Buddha are not separate but one. 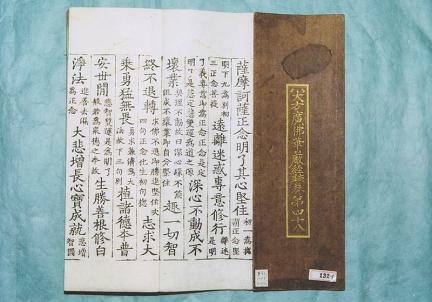 Hwaeomgyeong is the main Sutra of the Avatamsaka Order in Korea; together with the Myobeopyeonhwagyeong (Saddharma-Pundarika Sutra), it has had significant influence on the establishment of Buddhism in Korea. 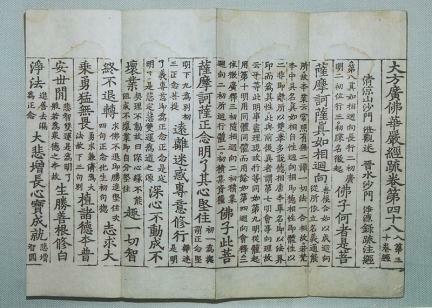 These books were printed from the wood-printing blocks sent by Jingyuan to Monk Uicheon via a merchant named Seo Jeon. They are Vols. 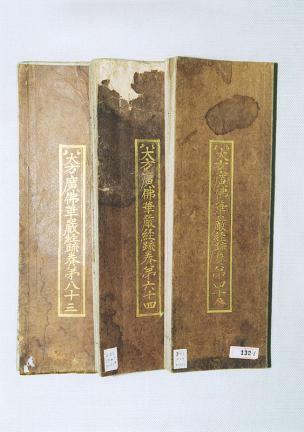 48, 64, and 83 among the 120 volumes of interpretational texts of Hwaeomgyeong printed, and they have been preserved well. 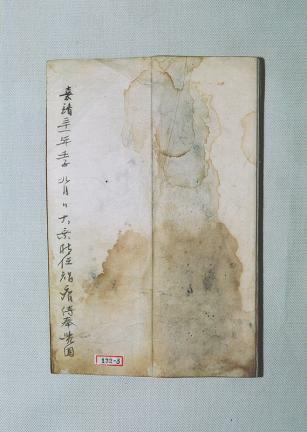 The cover is made of paper dyed with oak tree sap. 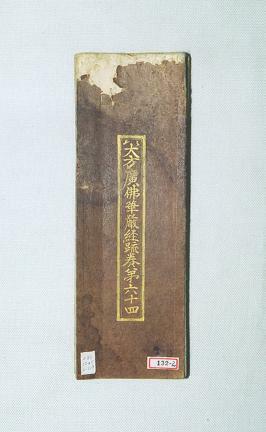 The titles on the cover and inside are written in gold powder. There is a single border at the top and bottom of the page, with boundary lines dividing the columns each of which has 15 characters. 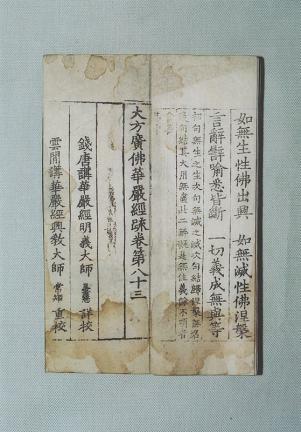 Each page is folded five times; printed at the folded places are the title of the book, volume, and chapter, apparently to allow for the more efficient management of the books. 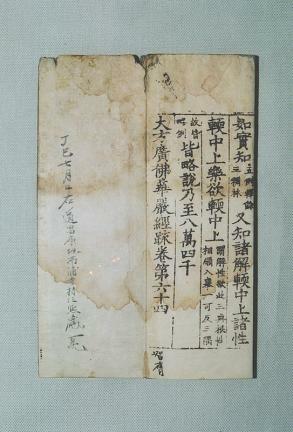 The paper is made of mulberry and is high-quality Korean paper that underwent a special process called dochim (smoothing layers of paper that have been pasted by beating them on a fulling block) to add luster and prevent the ink from spreading on the paper. At the end of Vol. 83 is an inscription that reads “the 49th year of the sexagenary cycle, the 31st year of Emperor Jiajing of the Ming Dynasty of China (i.e. 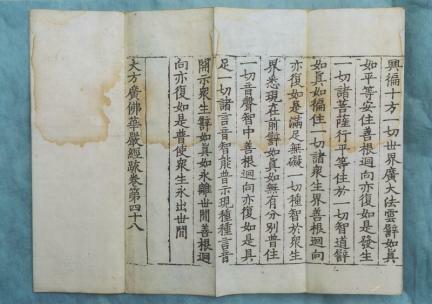 1552)…” which appears to be a record of ownership since it could hardly be the date of printing. 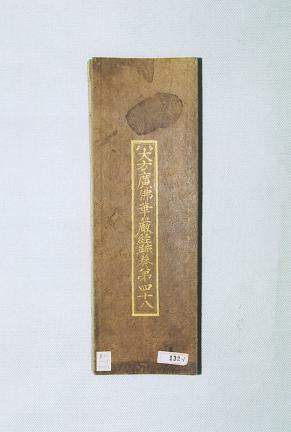 The characters are in the calligraphic style of famous Chinese calligrapher Ouyang Xun, which was very popular in woodblock prints of the Song Dynasty of China. 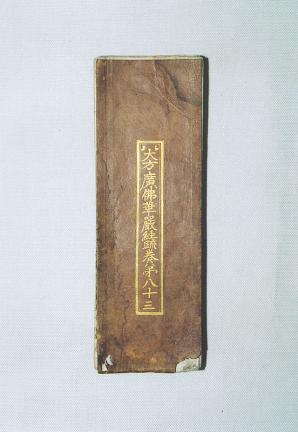 The strokes of the Chinese characters are clear and distinct, indicating that the books were printed in a relatively early period. 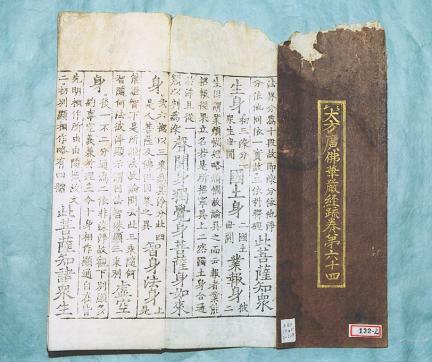 These Buddhist scriptures have significant historical value since they provide valuable information regarding Uicheon’s collection of Buddhist literature and the cultural exchanges between the Song Dynasty of China, Goryeo Dynasty, and Japan.